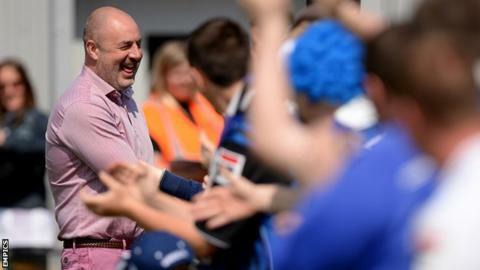 Rochdale manager Keith Hill says winning promotion to League One was made even more satisfying because the club did not buy success. The 44-year-old used the example of Manchester City, who are facing a fine in the region of £50m for failing Uefa's Financial Fair Play rules. "Where's the success in spending that type of money or being fined that type of money and arguably buying yourself a title?" Hill told BBC Radio Manchester. "We're living in our financial means." The former Barnsley boss, whose club did not spend any money on transfer fees during the 2013-14 season, continued: "We're working within a budget that's tailored to the money we have available. "The success has been superb and that's what's real about it. We're not spending money we haven't got. We're achieving it by producing players and work on the training pitch. "If those players make mistakes, I trust the players to learn from the mistakes. That's been forgotten in football. "It's all about money now, or even getting rewarded for being relegated from the Premier League. It's gone money mad and that's all we talk about, instead of doing what we're doing." Manchester City, who will claim the Premier League title for a second time in three seasons if they win their final two games, could face further sanctions from Uefa, including restrictions on their Champions League squad size and a cap on players' wages. City manager Manuel Pellegrini sidestepped the issue at a news conference on Tuesday. He said: "When it is official news of Uefa we can analyse what happens with the team. In this moment we don't know what happens." Dale finished third in League Two and will return to the third tier next term after a two-year absence.